CLICK The AviGard® Flex™ Net Size & Strength That's Right For You! Flexibility is the name of this game and AviGard's "Flex" bird net delivers! Interlocking knitted construction is strong, durable and flexible making installation and removal a snap. Diamond mesh net flexes in length and width to fit a variety of fruit trellises and leaf canopy dimensions. 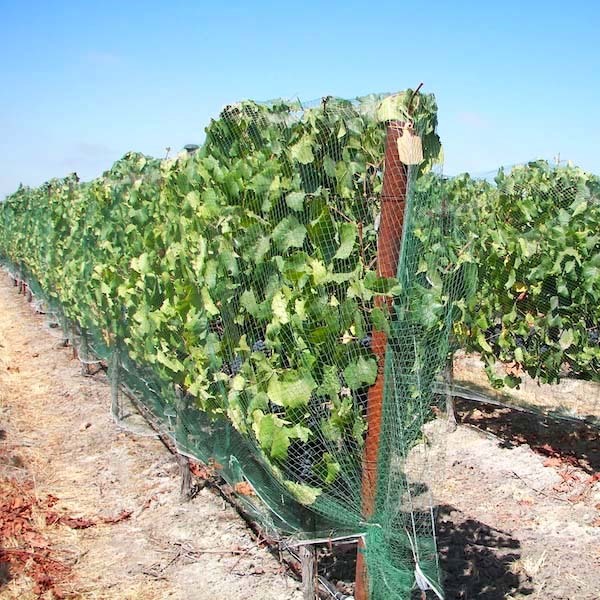 Whether you're looking for vineyard netting, blueberry netting, strawberry netting or wish another row crop AviGard Flex Diamond mesh has a size to fit your need. Our centering stripes visually help align the middle of the net over the row center. No more guessing where the middle of the net is or having one side applied longer than the other. Premium Grade - designed for 3-5+ seasons of U.V. exposure (many of our customers report getting 6 years or more with proper handling and storage).